It can be confusing to understand the difference between having minimally invasive surgery and having open heart surgery, so if you or your loved one have been told that heart surgery is needed, it’s important that you know exactly what that means. Before you have minimally invasive heart surgery in Canton, Ohio, let’s review the difference between the two options. With minimally invasive heart surgery, the surgeon will make the needed number of small incisions in between your ribs. Surgical instruments connected to robotic arms with a camera will be inserted into the incision. This type of robotic surgery will be controlled by the surgeon with a computerized device that allows the doctor to manipulate the instruments to perform your procedure with precision. While your heart may not be “opened” for surgery, typically open heart surgery consists of stopping your heart while a heart-lung machine does its work so that your surgeon can perform the procedure. Open heart surgery requires a 6-8 inch incision in your chest which may involve temporary placement of a pacemaker that will help regulate your heartbeat. Though each case is unique, open heart surgery is best when the patient needs a complex cardiac operation, complex aortic procedure, or multiple coronary artery bypass procedures. 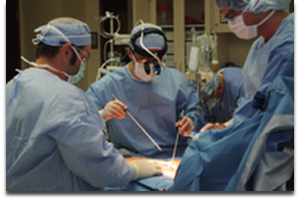 Our patients usually return home within 2-5 days after the procedure. However, it does take anywhere between 1-4 weeks to recover fully from minimally invasive heart surgery. If you would like more information about minimally invasive heart surgery in Canton, OH, please contact us so we can respond to your inquiries or concerns.